One of our favourite bars in Belfast, The Hudson called us with a slightly bizarre request a few weeks back. â€œConnor we need to brand a shed in the Yard for Oktoberfest.â€ Okâ€¦ Nothing too strange here to be fair. For others maybe, but the Hudson, this is a normal occurrence. To celebrate Oktoberfest, The Hudson Bar, Gresham Street, Belfast, took to branding a huge shed/come bar that would deliver craft beers and German rocket fuel to its patrons throughout September / October. We printed the price lists in the background onto vinyl and applied this to a rectangular foamex panel. Not only are these waterproof, but the photographic quality ensures the prices can be read from a distance back. The Hudson Design Team wanted to brand the peak and really personalise the shed with the bars branding. Their custom Oktoberfest logo was also printed onto vinyl and laid onto foamex, but this was shaped to fit the peak area directly above the bar. 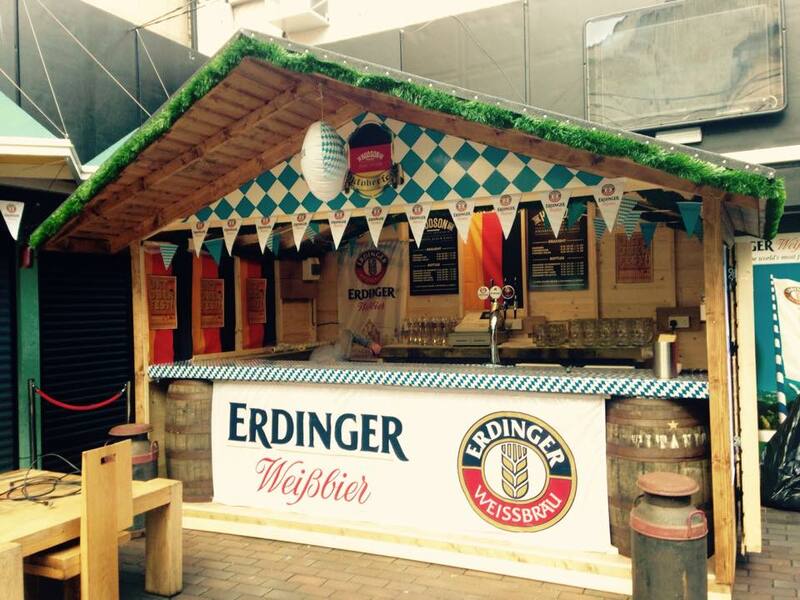 Coupled with some authentic Erdinger Weissbrau bunting and PVC banner prints, The Oktoberfest bar looks the part and doesn't break the bank in terms of costs. Whether it is a simple rectangle or a bespoke design, we have the ability to custom cut foamex to cut foamex boards to any shape you want. Shaped Foamex is also perfect for props for PR & Marketing photo shoots as well as in-store point of sale branding opportunities. Foamex is probably the most popular signage material we use within Kaizen Print. It is widely used by businesses in all areas to provide a low cost advertising medium. About The Hudson, Belfast The Hudson first opened itâ€™s doors in September 2011 as a small bar on Gresham Street. Since then weâ€™ve knocked through a few walls and grown into a three floored, four roomed, huge smoking area having beast with a door on Royal Avenue too.â€¨ We pride ourselves on our huge array of craft beers, whiskeys and great, simple food. We throw pretty good parties at the weekends too.â€¨ So if youâ€™d like a pint of our own Hudson Craft Lager, a bowl of the best chicken wings youâ€™ve ever had and a full on party in our Yard, then come on down! If you want to get in touch about some design, print or marketing, we're always available on 028 9002 2474. We'd love to chat to you and get an idea of how we can help your business.